Egyptian tennis player Mohamed Safwat has gone farther than any of his compatriots in 38 years at Wimbledon, having reached the final qualifying round of the grand slam event last month. Although the 27-year-old missed out on a place in the main draw after losing to American Michael Mmoh, he can still take heart from some recent fine displays that also saw him feature in the main draw of Roland Garros after replacing an injured player in May. "I am not the first Egyptian tennis player to reach that level. Former stars Ismail El-Shafei and Tamer El-Sawy made it farther than me," Safwat told Ahram Online. Egypt’s tennis legend El-Shafei won the boys singles tournament at Wimbledon in 1964 and was the runner up in 1963. He was the only Egyptian to make the top 40 in the Grand Prix/ATP rankings and one of only four players to beat former world number Bjorn Borg of Sweden in the third round en route to a quarter-final appearance at the 1974 Wimbledon Championships. El-Sawy had featured in most major events, including 13 grand slams. He lost in the opening round of the 1996 French Open. Since El-Shafei lost in the first round of the 1980 Wimbledon Championships, no Egyptian has come close to sealing a place in the main draw of oldest tennis tournament. But Safwat came within a whisker of doing so. In the first qualifying round, he defeated Britain’s 16-year-old player Jack Draper 6-4, 6-4. However, he fell at the last hurdle, losing 7-6(3), 4-6, 6-0 to American Mmoh. "My match against Draper was nice. I really enjoyed it although it was tricky. He was super motivated because he was given a chance to compete in the qualifying rounds of Wimbledon at such a young age," Safwat said. "Moreover, Draper was playing on home soil and I am sure he played on that grass more than I did. So, I needed to have a good start and keep pressure on him and I succeeded in doing that. "Micheal Mmoh was really solid. Just at the end of the second set, I fell down. I started to feel pain in my groin but I managed to win the second game. However, the pain got bigger in the third game of the third set and it was too tough to keep up the same level, although I tried to continue playing," he added. Safwat might have lost in his bid to reach the main draw of Wimbledon but he can still boast about becoming the first Egyptian to feature in a grand slam since 1996 when he played in the first round of Roland Garros little less than two months ago. Safwat became a professional player 10 years ago when he was only 17. He reached the semifinal at the challenger tournament in Launceston last year and was part of the Egyptian Davis Cup team that advanced to the third round of the Europe/Africa Zone II for the first time since 1996. He also won three titles in doubles on ATP challenger tour. "All my victories are precious," Safwat said. Safwat is currently ranked 168th in the men’s singles ranking of the ATP (Association of Tennis Professionals). When asked whether his ambitions include breaking into the top 10 of the ATP world rankings, he said: "The way to the top 10 is long and hard and I am making slow but steady progress." 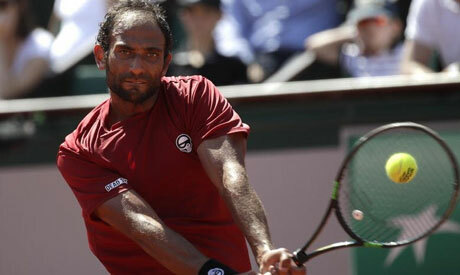 Safwat said he is gearing up for some important tournaments in the coming period. "I am now playing at the ATP World Tour 250 (qualified) which will be followed by Atlanta ATP 250 (Q), two ATP Challengers tour and the U.S Open (Q)," he added. Safwat will also participate in Davis Cup. Egypt will play against Finland in the third round in Europe/Africa Zone Group II. It will take place from 14-15 September at El-Gezira Sporting Club in Cairo.